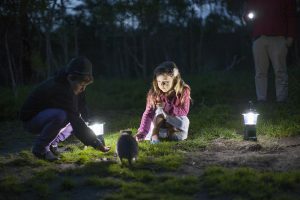 Only a 50 minute drive South East from Melbourne is Moonlit Sanctuary Wildlife Conservation Park. It sits at the top of the Mornington Peninsula and is a perfect location for a visit on the way to visit the Little Penguins on Phillip island. The park is the creation of founder and director Michael Johnson who even at a young age was had the desire to help animals even quoting it as his future ambition in his school yearbook. Inspired by British writer and Naturalist Gerald Durrell, Michael travelled to Jersey and completed the endangered species breeding course for conservation professionals at the Durrell Foundation conservation academy in 1996.
opened in 2001 and began by providing night time lantern tours giving the public the opportunity to get up close and personal to nocturnal animals that most people would not normally have the opportunity to view. Moonlit Sanctuary has won many local and state tourism awards and has become a popular wildlife tourism destination. 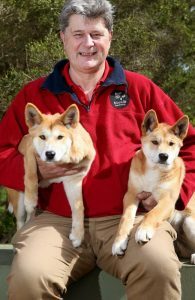 The park is a place where people can experience the rare and unusual animals that roam the Australian bushland and is responsible for helping halt the decline of certain endangered species through breeding programs. Some of the successes they have had are Eastern Bettongs, Eastern Quolls, Julia Creek Dunnarts and Squirrel Gliders. In 2007 the Sanctuary increased the number of animals that called it home and opened the doors during the day allowing more people to experience the creatures and critters that dwell here. Currently over 30 staff are employed and they welcome 100,000 plus visitors per year. emus, dingos, kangaroos, wallabies, tasmanian devils, snakes, many bird species and of course koalas! 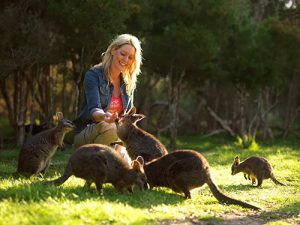 Those that are keen are able to opt for a close encounter with a python, dingo or a koala. I mean who doesn’t want a photo with a Koala?! There are many wildlife talks held during the day too! You’ll be able to get a schedule when visiting the park to see what’s available while you are there. reception and hand feed these gorgeous animals which are quite used to human interaction and will come right up to you. It’s an amazing experience which also makes for a great photo opportunity and souvenir. Visit Moonlit Wildlife Conservation Park with us and enjoy being the only tour operator at the park for the duration of our visit making sure it’s a special visit. Visit Moonlit Sanctuary on our Full day or Afternoon Phillip island tour.